This article is about the baseball variant. For the haircut, see Wiffle (hairstyle). For the measurement, see List of humorous units of measurement. Miniature versions of baseball have been played for decades, including stickball, improvised by children, using everything from rolled up socks to tennis balls. The ball most commonly used in the game was invented by David N. Mullany at his home in Fairfield, Connecticut in 1953 when he designed a ball that curved easily for his 12-year-old son. It was named when his son and his friends would refer to a strikeout as a "whiff". The classic trademarked Wiffle Ball is about the same size as a regulation baseball, but is hollow, lightweight, of resilient plastic, no more than 1/8 inch (3 mm) thick. One half is perforated with eight .75-inch (19 mm) oblong holes; the other half is non-perforated. This construction allows pitchers to throw a tremendous variety of curveballs and risers. Wiffle balls are typically packaged with a hollow, hard plastic, yellow bat that measures 32 inches (810 mm) in length and about 1.25 inches (32 mm) in diameter. The game became popular nationwide by the 1960s, and is played in backyards and on city streets and beaches. The game is similar to baseball, and can be played by between two and ten players. Tournaments have been the driving force in modern wiffle ball and have been held in the United States and Europe since 1977. That year, Rick Ferroli began holding tournaments in his backyard tribute to Fenway Park in Hanover, Massachusetts. In 1980, the World Wiffleball Championship was established in Mishawaka, Indiana. 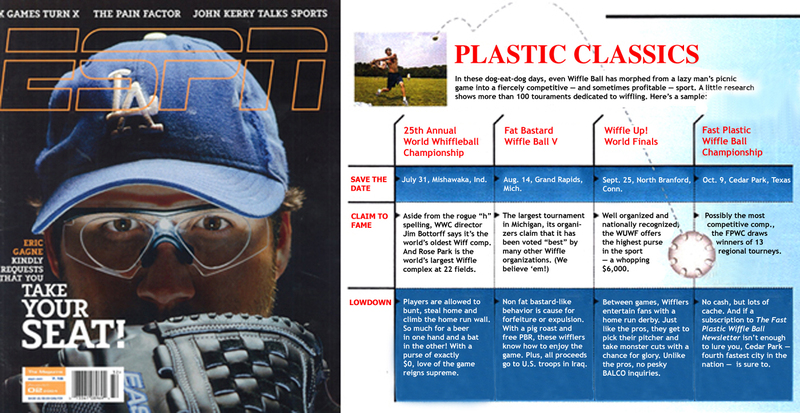 With the explosion of the Internet in the 1990s, there are now hundreds of Wiffle ball tournaments played in the United States, most in the same place every year, with a few tournament "circuits". The World Wiffleball Championship remains the oldest tournament in the nation, having moved to Skokie, Illinois in 2013, after introducing regional stops over three decades in Baltimore; Los Angeles; Indianapolis; Eugene, Oregon; and Barcelona, Spain. The tournament is featured at #20 in the popular book, "101 Baseball Places to Visit Before You Strike Out." In April 2011, the government of the State of New York proclaimed that wiffle ball, as well as kickball, freeze tag and dodgeball were "unsafe" and a "significant risk of injury" for children, and declared that any summer camp program that included two or more of such activities would be subject to government regulation. The story became a frequent source of ridicule and amusement, with Parenting.com sarcastically commenting "According to new legislation introduced in New York State, to survive classic schoolyard games like capture the flag is to cheat death." Wiffle ball executives originally thought the order was a joke. The company has never been sued over safety issues in its 50+ year history. The disapproval of people from across the nation pressured the New York legislature to remove wiffle ball and many other entries from the list of high risk activities, such as archery and scuba diving, that require state government oversight. ↑ "What's 50, Curvy And Full of Air? ; It's the Wiffle Ball, Still Popular, Holes and All". The New York Times. August 14, 2003. Retrieved August 14, 2014. ↑ "The Wiffle Ball, Inc. - A Brief History". www.wiffle.com. Retrieved 29 March 2017. ↑ "Wiffleball: A Connecticut invention that keeps giving back". ↑ "Official Site of the NWLA Tournament". NWLA Tournament. Retrieved June 20, 2018. ↑ "Official Site of the Little Fenway Wiffle Ball Field Located in Jericho, VT". Little Fenway. Archived from the original on February 2, 2012. Retrieved February 1, 2012. ↑ "Wiffle Ball Hits Home – Los Angeles Times". Los Angeles Times. October 11, 2000. Retrieved February 1, 2012. ↑ Peter Applebome (July 10, 2008). "Our Towns – Build a Wiffle Ball Field and Lawyers Will Come". The New York Times. Greenwich, Connecticut. Retrieved February 1, 2012. ↑ Blain, Glenn (April 19, 2011). "Classic kids games like kickball deemed unsafe by state in effort to increase summer camp regulation – New York Daily News". Articles.nydailynews.com. Archived from the original on December 24, 2011. Retrieved February 1, 2012. ↑ "Playground Games Deemed Unsafe for Kids". Parenting.com. April 20, 2011. Retrieved February 1, 2012. ↑ Blain, Glenn (April 20, 2011). "Wiffle Ball creators call scrapped New York state listing of backyard game as dangerous 'ridiculous' – New York Daily News". Articles.nydailynews.com. Retrieved February 1, 2012. ↑ "State Officials Back Off Regulating Freeze Tag, Kids' Games". NBC New York. April 19, 2011. Retrieved February 1, 2012. ↑ "Wiffle Ball Summer: The Ride of the Elmoron eBook: Geoffrey Arthur Drewyor, Art Drewyor, Eric J. Neeb: Kindle Store". Amazon.com. Retrieved February 1, 2012. ↑ Larson, Gary (2003). The Complete Far Side. 2. Andrews McMeel Publishing. p. 71. ISBN 0-7407-2113-5. ↑ "Live Webcams: Scientists Studying Corals Damaged by Oil in the Gulf of Mexico". Penn State Science. 25 June 2014. ↑ "PHOTOS & VIDEO". Nautilus Live. Retrieved 30 April 2015. Wikimedia Commons has media related to Wiffle Ball.